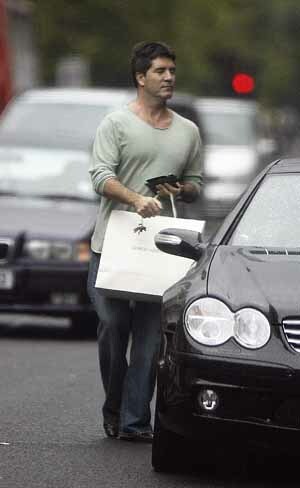 Pics of Simon Cowell shopping in Sloane Street, West London. It was recently reported that Simon Cowell had found a bug attached to one of his cars, and that it may not be the security services that planted it, in fact I am fairly certain that it would be a member of the media community. These devices are freely available and as long as they are used with a pay as you go sim with no details recorded as to who it was owned by, and also assuming that the finger prints of anyone that touched it are not known to the plod, they will be unlikely to find out who it was. These trackers are freely available in the UK. There are several retailers that will everything required. It is basically a datacard with a power supply. You can dial the tracker and using software on your p.c. or a web-based mapping service see where the tracker is, in real time. I am not sure what offence may be being committed by the placement of a tracker on a third party’s vehicle may be, but I understand that Simon Cowell is a little put out by the situation, and with his wealth he is probably the last person that you’d want chasing after you with his legal team. Simon Cowell has been caught out in the past on assignations and it would not surprise me if that was what the person who planted the device was after. It could also have been placed by a Private Investigator, as they are known to use them, maybe he has slept with somebody’s wife that he shouldn’t have. ← Bang! Bang! Your Dead!